The 2014 Key Scientific Accomplishments report in fundamental and computational sciences is now available as a downloadable PDF. 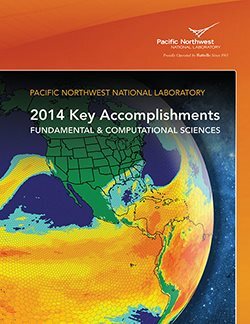 This 32-page full-color brochure highlights some of the year's most noteworthy science achievements by Pacific Northwest National Laboratory scientists, including findings that have informed numerous areas of basic science and influenced important global challenges in energy, security, and environmental sustainability. The report features biological systems science, climate and Earth systems science, chemical imaging, chemistry and geochemistry, materials sciences, advanced computing, nuclear and particle physics, and developments at the Environmental Molecular Sciences Laboratory. Staff awards and achievements are also highlighted. Several staff members were recognized for their achievements, such as awards or recognition from Thomson Reuters' Highly Cited Researchers, the Society of Toxicology, the International Society for Microbial Ecology, the Royal Society of Chemistry, the Institute of Electrical and Electronics Engineers, and other professional and scientific societies.